“Medical Errors are No. 3 Cause of US Deaths“. As someone who has spent her entire career working in hospitals, I was interested to see this headline a few weeks ago. I was intrigued by the data, but a little skeptical. Not only have I seen a lot of patient deaths, but it seems relatively rare in my day-to-day life that I see someone reference a death by medical error. However, according to Makary et al in the BMJ this month, it happens over 250,000 times a year. This study is actually a review, combined with some mathematical modeling. Though reported as a study in the press, this was actually an extrapolation based off of 4 earlier studies from 1999, 2002, 2004 and 2010. I don’t have access to the full paper, but according to the Skeptical Scalpel, the underlying papers found 35 preventable deaths. It’s that number that got extrapolated out to 250,000. No one needs to have made an error for something to be called an error. When you hear the word “error” you typically think of someone needing to do “x” but instead doing “y” or doing nothing at all. All 4 studies used in the Makary analysis had a different definition of “error”, and it wasn’t always that straightforward and required a lot of judgment calls to classify. Errors were essentially defined as “preventable adverse events”, even in cases where no one could say how you would have prevented it. For example, in one study serious post-surgical hemorrhaging was always considered an error, even when there was no error identified. Essentially some conditions were assumed to ALWAYS be caused by an error, even if they were a known risk of the procedure. That definition wasn’t even the most liberal one used by the way….at least one of the studies called ALL “adverse events” during care preventable. That’s pretty broad. 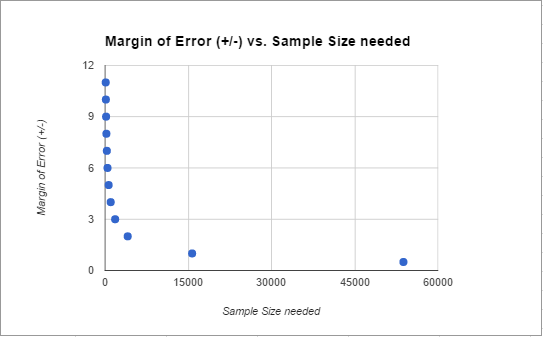 Some of the samples were skewed. The largest paper included actually looked exclusively at Medicare recipients (aka those over 65), and at least according to the Science Based Medicine review, it doesn’t seem they controlled for the age issue when extrapolating for the country as a whole. The numbers ultimately suggest that 1/3 of all deaths occurring in a hospital are due to error…..which seems a bit high. Prior health status isn’t known or reported. One of the primary complaints of the authors of the study is that “medical error” isn’t counted in official cause of death statistics, only the underlying condition. This means that someone seeking treatment for cancer they weren’t otherwise going to die from who dies of a medical error gets counted as a cancer death. On the other hand, this means that someone who was about to die of cancer but also has a medical error gets counted as a cancer death. Since sick people receive far more treatment, we do know most of these errors are happening to already sick people. Really the ideal metric here would be “years of life lost” to help control for people who were severely ill prior to the error. Over-reporting of medical errors isn’t entirely benign. A significant amount of my job is focused on improving the quality of what we do. I am always grateful when people point out that errors happen in medicine, and draw attention to the problem. On the other hand, there is some concern that stories like this could leave your average person with the impression that avoiding hospitals is safer than actually seeking care. This isn’t true. One of the reasons we have so many medical errors in this country is because medicine can actually do a lot for you. It’s not perfect by any means, but the more options we have and the longer we keep people alive using medicine, the more likely it is that someone administering that care is going to screw up. In many cases, delaying or avoiding care will kill you a heck of a lot faster even the most egregiously sloppy health care provider. Again, none of this is to say that errors aren’t a big deal. No matter how you define them, we should always be working to reduce them. However, as with all data, it’s good to know exactly what we’re looking at here. Recently I had a discussion with a friend from childhood who is now a teacher. She had liked my “Intro to Internet Science” series, and we were discussing the possibility of me coming and chatting with her AP chemistry class about it. We were discussing time frames, and she mentioned it might be best to come in April when the kids started writing their thesis. “Every year they get upset I won’t let them use blog posts instead of peer-reviewed journal articles.” she said. Anybody can be a blogger. One of the best things about blogging is that it’s an incredibly easy field to enter. It takes less than 15 minutes to set up a blogger or WordPress account and get started. It takes about $20 to register a custom domain name. This is awesome because you can hear lots of voices on lots of topic you wouldn’t have otherwise had access too. This is also terrible because there are lots of voices on lots of topics you wouldn’t have otherwise had to deal with. Nothing stops people from fabricating credentials, using misleading titles or just flat out making stuff up. Don’t believe me? Health and wellness blogger Belle Gibson built an enormous empire based on her “I cured my cancer through whole foods” schtick…..only to have it revealed she never had cancer and had no idea what she was talking about. Peer review isn’t perfect, but any deception perpetrated in published papers will have taken a huge amount of time to pull off. Simply out of laziness, that means there will be less outright fraud (although it does still happen). No one checks bloggers before we hit publish. Like many bloggers, I do most of my blogging late at night, early in the morning or on weekends. I have a full time job, a husband, a child, and I take classes. I’m tired a lot. Despite my best intentions, sometimes I say things poorly, let my biases slip in, or just do my math wrong1. I happen to have smart commenters who call me out, but it’s plausible even they miss something. I try to adhere to a general blogger code of conduct and provide sources/update mistakes/be clear on my biases when I can, but I will not always be perfect. No one will be. With peer-reviewed papers, you know MANY people looked at the papers before they went to press. Doesn’t make them perfect, but it does mean they’ll far less likely to contain glaring errors before publication. Also, good bloggers talking about a scientific paper will ALWAYS cite the primary source so you can find it and see for yourself. Here’s a few rules for assessing how they did that. Blog posts can mislead. While many bloggers are driven by nothing more than a desire to share their thoughts with the world, many are doing it for money or other motivations. Assuming that blog posts are actually marketing tools until they prove otherwise. I wrote a whole 10 part series on this here, but suffice it to say there are many ways blog posts can deceive you or make things sound more convincing than they are. Science changes, but the internet is forever. Even if you find a good solid blog post from a thoughtful person who cited sources and knew what they were talking about, you’re still not out of the woods. The longer the internet sticks around, the more things will outdate or need updating, even if they were right at the time the author wrote them. I’ve started a series where I go back to posts I wrote back in 2012/2013 and update them with new developments, but nothing will stop Google from pulling them up in search results as is. Using blog posts robs you of a good chance to learn how to read scientific papers. Reading scientific papers is a bit of an art form, and it takes practice. Learning how to find critical information, how to figure out what was done well (or not at all! ), and doing more than just reading the press release can take some practice. Everyone has a slightly different strategy, and you’re not going to find the one that works for you unless you read a lot of them. If you’re still at the point in your life where you have external motivations to read papers (like, say, a teacher requesting that you do it), take advantage of that. It’s a skill you’ll value later, one of those “you’ll thank my when you’re older” things. In conclusion: One of my favorite blog taglines ever is from Scott Greenfield’s Simple Justice blog “Nothing in this blog constitutes legal advice. This is free. Legal advice you have to pay for.” Same goes for science blogging. If it’s free, you get what you pay for. What’s a p-value and Why Is Everyone So Mad At It? A reader named Doug has sent me a couple of awesome articles about p-values (thanks Doug!) and why we should regard them with suspicion. As often happens with these things, I subsequently tried to explain to someone unfamiliar with stats/math why this is such an interesting topic that everyone should be aware of and realized I needed a whole blog post. While most people outside of research/stats circles won’t ever understand the math part of a p-value calculation, it’s actually a pretty important concept for anyone who wants to know what researchers are up to. Thus, allow me to go all statsplainer on you to get you up to speed. Okay, so why are you anthropomorphizing p-values and accusing people of being mad at them? Well, you probably didn’t click on the link up there that Doug sent me, but it was a post from the journal Nature on the American Statistical Association’s recent warning about the use of p-values in published literature. P-values and the calculation thereof are a pretty fundamental part of most basic statistics courses, so to see a large group of statisticians push back against their use is a bit of a surprise. Gotcha. So the people who taught us to use them in the first place are now telling us to watch out for them. Fantastic. That’s a terrible joke. I’m not even sure I get it. Yeah, statistical humor tends to appeal to a limited audience. What it’s trying to point out though is that we’ve gotten ourselves in to a difficult spot by teaching “what everyone does” and then producing a group of people who only know how to do what they were taught. Okay, that makes sense I guess…but what does the whole p=0.05 thing even mean? Well, when you’re doing research, at some point or another you’ll want to do something called “hypothesis testing”. This is the basis of most published studies you hear about. You set up two opposing sides, formally called the null and alternative hypothesis, and then you figure out if you have the evidence to support one or the other. The null hypothesis H0, is typically the theory that nothing interesting is happening. Two groups are equal, there’s no change in behavior, etc etc. The alternative hypothesis Ha, is typically the theory you REALLY want to be true…at least in terms of your academic career. This would mean that something interesting is occurring: two groups are different, there’s a change in behavior, etc etc. Okay, I’m with you so far…keep going. This next step can work differently depending on the experiment/sample size/lots of other details, but lets say we’re comparing Star Bellied Sneetches to those without stars on their bellies and seeing if the groups eat a different amount of dessert. After we calculated the average dessert eaten by both groups, we would calculate something called a t statistic using this equation. Once we have that value, we take the amusingly old school step of pulling out a table that looks like this, and then finding the value we want to compare our value to. Okay, so how do we figure out where on this table we’re looking? Well, the degrees of freedom part is another whole calculation I threw in just to be annoying, but the other part is your α, or alpha. Alpha is what we’re really referencing when we say p=0.05….we set our significance level (or alpha) at .05, so now that’s what we’re aiming for. If the value we calculated using that equation up there is larger than the value the table gives, then it’s considered a finding significant at the level of alpha. I think I lost you. That’s fine. Most stats software will actually do this for you, and spit out a nice little p-value to boot. Your only decision is whether or not the value is acceptable. 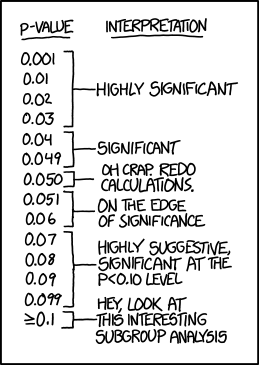 The most commonly used “significant” value is p < .05. Okay, how’d we pick that number? This is where we get in to the meat of the issue. There’s no particularly good reason why .049 can make a career and .051 doesn’t. As I showed with the equation above, the difference between those two values can actually be more about sample size than the difference in effect. In theory, the p-value should mean “the chances we’d see an effect larger the one we are seeing if the null hypothesis was true”, but the more people aspire to the .05 level, the less accurate that becomes. Well, a couple reasons. First, the .05 value will always mean that 1 out of 20 p-values could be due to chance. For some studies that gather a lot of data points, this means they will almost always be able to get a significant finding. This tactic was used by the journalist who published an intentionally fake “chocolate helps you lose weight” study last year. He did a real study, but collected 18 different measures on people who were eating chocolate, knowing that chances were good that he would get a significant result on one of them. Weight loss ended up being the significant result, so he led with that just downplayed the other ones. Other researchers just throw the non-significant effects in the drawer. There’s also the issue of definitions. It can be really hard to grasp what a p-value is, and even some stats text books end up saying wrong or misleading definitions. This paper gives a really good overview of some of the myths, but suffice it to say the p-value is not “the chance the null hypothesis is true”. Okay, so I think I get it. But why did the American Statistical Society speak out now? What got them upset? Let’s be clear. Nothing in the ASA statement is new. Statisticians and others have been sounding the alarm about these matters for decades, to little avail. We hoped that a statement from the world’s largest professional association of statisticians would open a fresh discussion and draw renewed and vigorous attention to changing the practice of science with regards to the use of statistical inference. As replication crises have rocked various fields, statisticians have decided to speak out. Fundamentally, p-values are really supposed to be like the SAT: a standardized way of comparing findings across fields. In practice they can have a lot of flaws, and that’s what the ASA guidance wanted to point out. Their paper essentially spelled out their view of the problem and proposed 6 guidelines for p-value use going forward. They provide more explanation in the paper, but basically what they’re saying is what I was trying to get across above: p-values are useful if you’re being honest about what you’re using them for. They don’t tell you if your experimental set up was good, if your explanation for your data is reasonable, and they don’t guard against selection bias very well at all. The number “.05” is good but arbitrary, and the whole thing is a probability game, not a clear “true/false” line. Okay, I think I get it….but should statisticians really be picking on other fields like this? Believing a theory is correct because someone reported p less than .05 in a Psychological Science paper is like believing that a player belongs in the Hall of Fame because hit .300 once in Fenway Park. This is not a perfect analogy. Hitting .300 anywhere is a great accomplishment, whereas “p less than .05” can easily represent nothing more than an impressive talent for self-delusion. But I’m just trying to get at the point that ultimately it is statistical summaries and statistical models that are being used to make strong (and statistical ridiculous) claims about reality, hence statistical criticisms, and external data such as come from replications, are relevant. Got a question you’d like an unnecessarily long answer to? Ask it here! After 1936, measurements are from Boston Logan Airport. Apparently that’s when the weather station opened there. I’m not completely sure where they came from prior to that, but presumably it was somewhere in the area. For all data, the year means “season ending in”. So my 2016 totals include November and December of 2015. I only looked at November-April. October and May have both had snow, but the snow that fell in those months has never gone over 1.5 inches for any season. So it appears January and February are approximately equal for most years, but February can pack a bigger punch. Interesting. This shows that this year we actually had a slightly above average February, we just didn’t notice because last year was insane. Okay, but what about total snowfall? Where are we so far? So basically we have a year with legitimately low snow totals that was preceeded by a year with outrageous snow totals.Kind of explains the whiplash. But where are we on the whiplash scale? Is this the biggest year to year change in snow totals ever? Well, we hit a record for that this year for sure. An 87 inch difference in snowfall totals for consecutive years is pretty record breaking. Interestingly though, there were two streaks I found that actually gave people whiplash for 4 years in a row. The 1994-1997 run, where the snow totals swung up to almost 100 inches for two winters (1994 and 1996) and then hit low totals on the alternating years (16 inches and 30 inches in 1995 and 1997, respectively). 2002-2006 was similar, though less dramatic. In order to compete, 2017 will have to hit 90 inches or more of snow. Don’t do that 2017, don’t do that. How Do They Call Elections so Early? I live in Massachusetts now, but for the first 18 or so years of my life I lived in New Hampshire. I still have most of my family and many friends there, so every 4 years around primary time my Facebook feed turns in to a front row seat for the “first in the nation primary” show1. This year the primary was on Tuesday February 9th, and it promised to be an interesting time as both parties have unexpected races going on. I was interested in the results of the primary, but since I tend to go to bed early, was unsure I’d stay up late enough to see it through. Thus like many others, I was completely surprised to see CNN had called the race around 8:30 for Trump and Sanders with only 8% of the votes counted. By 8:45 I had a message in my inbox from a NH family member/Sanders supporter saying “okay, how’d they do that????”. It’s a great question and one I was interested to learn more about. It turns out most networks keep their exact strategies secret, but I figured I’d take a look at the most likely general approach. I start with some background math stuff, but I include pictures! Okay, first things first, what information do we need? #1 is pretty easy here. About 250,000 voters voted in the Democrat primary, and 280,000 voted in the Republican primary. This doesn’t matter much when it’s this large. If you’re missing the reference Wikipedia’s got your back, but suffice it to say networks live in fear of a missed call. 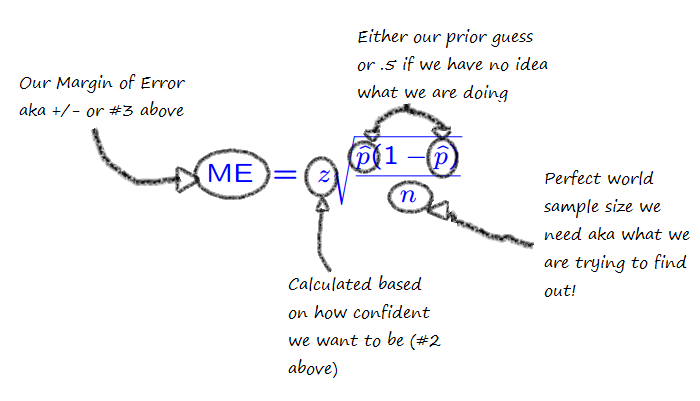 Margin of error is basically how close those x’s need to be to the target, confidence interval (#2) is how close you need them to be to each other. #4 is whether or not you’re working from scratch or you have a guess. Basically, do you know ahead of time what percent of people might be voting for a candidate or are you going in blind? #5 is all the other messy stuff that has nothing to do with math. Okay, so what do we do with this? So basically what that’s saying is that the more confident and precise you need to be, the more people you need to poll. Additionally, the larger the gap between your “percent saying yes” and “percent saying something else”, the fewer people you need before you can make a call. A landslide result may be bad for your candidate, but great for predictions. Okay, thanks for the math lesson. Now what? Now things get dirty. What I showed you above is basically how we’d do an estimate for each of the candidates, putting in their prior polling numbers for p one at a time. What about the other numbers though? We know we have to set our confidence high so we’re not embarrassed, but what about our margin of error? Well here’s where all those phone calls you get prior to the election help. Going in to voting day, the pollsters had Trump in the lead at 31%, with his next closest rival at 14%. This 17 point lead means we can set our margin of error pretty wide. After all, CNN doesn’t have to know what percent of the vote Trump got as much as it needs to know that someone is really unlikely to beat him. If you split it down the middle, you get a margin of error of 8. Their count could be off by that much and still only lower Trump to 23% of the vote and raise his opponent to 22%. However, that assumes all of his error would go to his closest opponent. With so many others in the race that’s unlikely to happen, so they could probably go with +/- 10. For the Democrats, I found the prior polls showed Sanders leading 54% to Hillary’s 41%. Splitting that difference you could go about +/- 6. In a perfect world this means we’d need about 160 random votes to predict Trumps win and about 460 to predict Sanders win at the 99% confidence level. Whoa that’s it? Why’d they wait so long then? So as precincts report, we know there’s likely some bias to those numbers. If the 8% of the votes you’ve counted are from throughout the state, you have a lot more information than if those 8% are just from Manchester or Nashua. Because of this most networks have eschewed strict stats limits like that one I did above in favor of slightly messier rules. So why’d you tell us all that other stuff? Anything lead closer than about +/- 4 (or about an 8 point difference) gets increasingly more difficult to call. If you’re over that though, you can act a little faster. In this case, both leads were bigger than that from the get go. To hedge their bets against bias, the networks likely produce some models of the state based on past elections, polling, exit polls and demographic shifts, call the election the day before, then spend election night validating their models/predictions. Bayesian inference would come in handy here, as the networks could rapidly update their guesses with new information. So they’re not really calculating “what is the probability that Trump is winning” they’re calculating “given that the polls said Trump was winning, what are the chances he is also winning now”. That sounds like semantics, but it can actually make a huge difference. If they saw anything unusual happening or any conflicting information, they could delay (justifying a few veteran election watchers hanging out to pick up on this stuff), but in this case all their information sources were agreeing. As the night went on, it became apparent that Trump and Sanders were actually out performing the pre-election polls, so this probably increased the network’s confidence rapidly. In pre-election polls, the most worrying thing is non-response bias. You get concerned that those answering the polls are not the same as those who are going to vote. Voting results eliminate this bias….in a democracy we only count the opinions of those who show up at the polls. So if you get two different types of samples with different error sources saying the same things, you increase your confidence. Overall, I don’t totally know all the particulars about how the networks do it, but they almost certainly use some of the methods above in addition to some gut reactions. With today’s computing power, they could be individually computing probabilities for every precinct or have very advanced models to predict which areas that were most likely to go rogue. It’s worth noting that the second place Clinton and Kasich won very few individual districts, so this strategy would have produced results quickly as well. So there you have it. The more accurate the prior polling, the greater the gap between candidates, the more regions reporting at least some of their votes, and the less inter-region variability, the faster the call. An hour and a half after the polls close seems speedy until you consider that statistically they probably could have called it accurately after the first 1% came in. No matter how mathematically backed however, that definitely would have gotten them the same level of love that my over-zealous-in-class-question-answering habits got me in middle school. They had to be quick, but not too quick. My guess is that last half hour was more a debate over the respectability of calling so soon rather than the math. Life’s annoying like that some times. Got a stats question? Send it in here! Updated to add: Based on a Facebook conversation about this post, I thought I should add that if the race is REALLY close, the margin of error with the vote counting itself starts to come in to play. Typically things like absentee ballots aren’t even counted if it won’t make a difference, but in very close races when every ballot matters, which ballots are valid becomes a big deal. The weirdest example of this I know of is the Al Franken/Minnesota senate seat election from 2008. It took 8 months to resolve which votes were valid and get someone sworn in. I’m starting a new feature here that I’ve been doing informally for a while now: reader questions. While I like to amuse myself with my stats based/personal life advice column, I get far more requests for feedback on random things readers come across and want someone to weigh in on. So….if you have a question, see something irritating on Facebook, or just generally want someone to take a look at the numbers, get in touch here.